NIOS Result 2019 Class 10 & 12: National School of Open Schooling result class 10 and 12t of examination conducted in Oct- Nov 2018 is currently available on its official website. Learners who have appeared in these examination can check their result online by using their enrollment No. NIOS is an autonomous institute under the Ministry of Human Resource Development (HRD), Govt. of India. NIOS offer various distance programs from secondary to higher educational level along with vocational programs. It offers secondary and higher secondary i.e. class 10th and 12th courses twice a year and declares the result on its official website. In the given article, learners and other readers will get all the details related to NIOS results for class 10 and 10+2 October/November 2018. 2 How to Download NIOS 2019 Result? How to Download NIOS 2019 Result? Learners have to visit NIOS official website. On the homepage, learners have to click on the “Result” tab. Learners have to click on “Check Result” link provided under the “Public Examination Result” option. Now, they have to enter their 12-digit enrollment result to check the result. Finally, result will appear on the screen and learners can download the result for future references. You should also take printout of the NIOS result 2019 for future references. NIOS result will be published online indicating the result, grade or marks of the candidates of secondary and senior secondary course. Secondary and Senior secondary students have to obtain minimum qualifying marks in order to obtain the NIOS certificate. After the declaration of result, NIOS will issue certificates to the candidates qualifying the exam. Certificates will be issued only to the candidates who will qualify the exam and will complete the course. Students can obtain their mark sheets and certificates from the concerned NIOS regional office. For that, they have to apply from the official portal or regional office and have to pay prescribed fee. Secondary (class 10th) Minimum 33% marks in aggregate (include theory plus practical marks) in exam. Pass in 5 subjects including at least one language*. Senior Secondary (Class 12th) Minimum 33% marks in aggregate and also separately in theory and practical exam. Pass in 5 subjects including at least one language*. * Language subjects should not be more than two. It means out of 5 subjects candidates can have maximum two language subjects. In case, any of the candidate of secondary or senior secondary course is not satisfied with result, then he/she can apply for re-checking of answer sheets. NIOS learner have to apply within 15 days from the of declaration of result. Learners can apply either through online or at the regional office. Candidates also have to pay an application of Rs.300 per subject. Application fee can be paid through online or offline mode. The process of rechecking is completed within 30 days from the date of application and the new result will be final. Re-checking is only applicable for theory answer sheets. Students must keep in mind that only re-totaling of marks is done in this process and no evaluation of answers is practiced. Re-checking also ensures that no answer is left unchecked/ unevaluated. Apart from rechecking of answer scripts NIOS also provides an opportunity of re-evaluation to answer scripts for class 12th. Re-evaluation of answer scripts is only permissible at senior secondary level. Learner has to apply within 15 days of declaration of result through online or offline mode. Applicants have to pay an application fee of Rs.800/- per subject. Re-valuation is only available in theory marks and will be completed within 45 days from the application. NIOS result for Oct-Nov 2018 exam is available on the official website. In case of any discrepancy in result, candidates can apply for correction within the specified dates. Application for correction after the due dates will be not be entertained. After the declaration of result, candidates can also apply for re-cheching and re-evaluation of answer scripts. 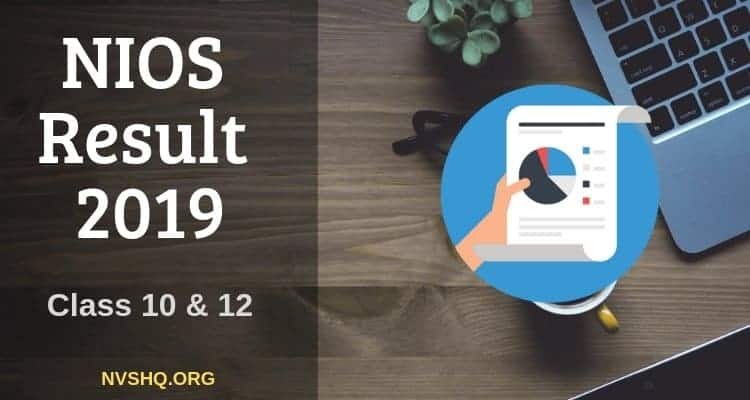 If you have any problem in download your NIOS 2019 result class 10 or 10+2 then you can tell us in the comment box below and we will help you in solving your query.